The Battle of Dove Creek. You’ve never heard of it have you? It was the largest battle fought between Native Americans and white men during the American Civil War. It was a great tragedy. SIDESHOW AT HONEY CREEK tells of how that tragedy never should have happened yet came to be. It tells the very human story of those involved. Men, women, good and evil, stumbling into these events as they struggled to survive the bitter winter of 1864. Vivid characterization, accurate vision of the times – Hell, it’s a good read. Be surprised and pleased. 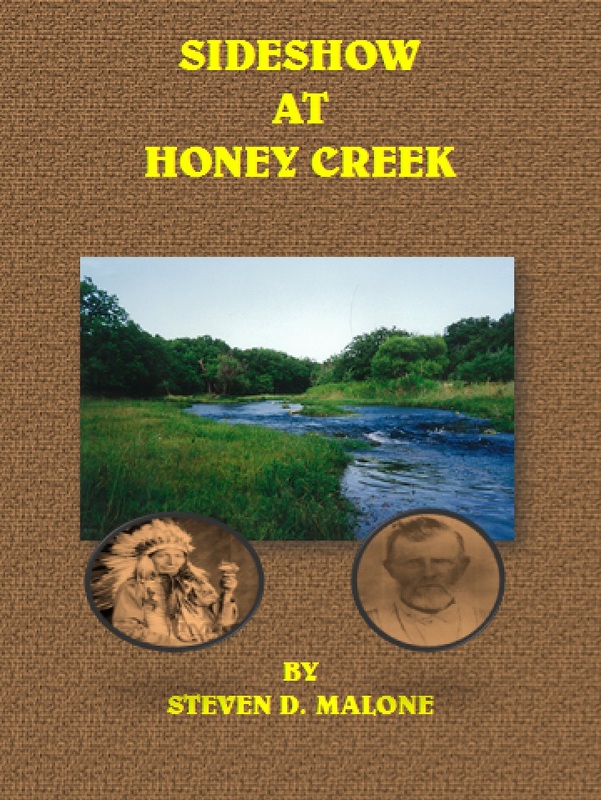 “Sideshow at Honey Creek” by Steven D. Malone is a fascinating historical find about one of the lesser known stories of American History, at least it was for me, a European. It is no surprise that the author has a degree in History, the research he must have done for this book is enormous. Malone paints a credible and impressive picture of the times, climate, landscape and other historical details. The big picture deals with the involvement of Kickapoo and Comanche Indians in Texas during the American Civil War. The smaller stories follow several groups of colourful characters and their personal ordeals during this time – too many to name individually and better left for you to discover on your own. All you need to know is that the plot lines are well chosen and skilfully developed and the connections between these people are nicely set up. The book is a great achievement in research, execution and fleshing out of the scenes, it uses copious amount of detail, making it easy to picture the settings. It is an epic read with a lot of information on a lesser known era of American history, yet one that deserves a bit of a spotlight for those of us who take their main knowledge about Native Indians from Westerns and adventure stories. This book clears up some misconceptions and beyond the factual it provides us also with food for thought. It has stayed with me for some time after I finished it. Read it! Though always a reader, when I was about 12 or 13 our neighbour moved. After he was gone I saw boxes left by the trash cans. They were filled with paperback books – mostly cheap, tawdry men’s adventure books filled with swarthy adventurers unshaven and buxom willing skanks, violence, and exotic locations. I loved them and due several years of therapy, I’ll need to get someday. I quickly became aware of wanting to entertain people the way these books did me. I wanted to take readers to places they had never been and have adventures they had never had. From that day I schemed to turn every report assignment in school into adventurous short stories. I did similar the rest of my life. History is biography. Our lives are history. History is a living thing for me. That’s my connection. It is, in addition, a large enough connection to include future history (SciFi) and fantasy history (things like Tolkein and White write). When did you first have the idea for “Sideshow at Honey Creek”? My father heard that people who retire can die sooner than people that work until they drop. He decided to take up genealogy to have a post-retirement focus. He dug up the basic life story of my great-great-great grandfather. I researched the times, events, and environment surrounding this man’s life. His family, friends, and brother frontiersmen kept turning up in old news articles, and Texan’s memoirs. These people seeded the evolution of the characters that populate my book. The actual research and writing probably took 3 years spread over 5. However, the manuscript sat on the shelf for 10 years before my wonderful son bullied me into publishing it. Any way that it can be done. This turns out to be a harder question than it first appeared. I haunt used bookstores and libraries. I stare hypnotised at microfiche film of old newspapers. I scour published genealogy books (a great source of anecdotal stories). I ruin my eyes searching google and bing. I read and read and read. I Xerox and Xerox and Xerox. I fill and store liquor boxes with it all much to my wife’s disgust. Very comfortable. It’s my first and greatest love. Sorry, wife. I do often worry about skewing exact chronologies to better fit my plot and my character’s stories but all of my favourite writers confess to this. They confess to letting their heroes do things historical people actually did. But, to paraphrase Bernard Cornwell; a hero must have something to do. I don’t want to say. But promise to keep it a secret. These days I prop myself in front of the TV showing old movies and missing them as I type on my computer. When the world was young and I was poor, I jammed a notebook in my lap under any shade I could find and scribbled with a fountain pen. I mean it about the shade: under trees at the state park I lived in with my Chevy, a picnic table on the beach I lived at with my Pontiac, bus stops, the steps of office buildings, my girlfriends porch, the floor of the unfurnished apartment I managed to find the money for. Forty or more. I wish I could do more but it would get worse not better. I’m my own editor for good or ill. I think I do pretty good at it and judge my work as I judge the works I read. My quality control would be friends and family that say something like. ‘You wrote that?’ Then they say, ‘No Steve, it’s a good book, I liked it.’ Of course, once it’s out my good readers drop reviews on amazon that surprise me beyond anything I can express. This seems to work – it’s a good read. Barbara Tuchman. Tolkein. Dumas. Thomas B. Constain. Robert Lowe. Bernard Cornwell. Chaucer. Robert Graves. John Gardner. The list can go to several pages if I let it. I have no answer for this question. First, I want my readers to envision my characters. Second, were I lucky enough to get the book made into a movie, I am humble enough to give that power to the director. The movie is his art not mine. Let him or her have that vision. I completely agree. Our treatment of all of the Indian Nations is an eternal shame embarrassment. I have told this story from the view of the white men and women that participated in these events for the most part. It is my story to tell. The story of the Kickapoo Nation at Dove Creek (the battle took place there not at Honey Creek) is a story they must tell. I hope they will soon. We need to hear it. Thank you Paulette, I completely agree. An interview is only as good as the person in willing to put in their answers and I have had very good luck so far. Mind you, I have only picked the very best of writers. It is great to look back at these treasures. So many books that are worth our time, so little time to read them all. And thanks Steven for being here and for having taken the time of research and writing this great book. I wanted to thank you for providing me with this opportunity. It has been a great experience. Your site is impressive. Your interviewed authors are wonderful and I have enjoyed getting to know them and their books.